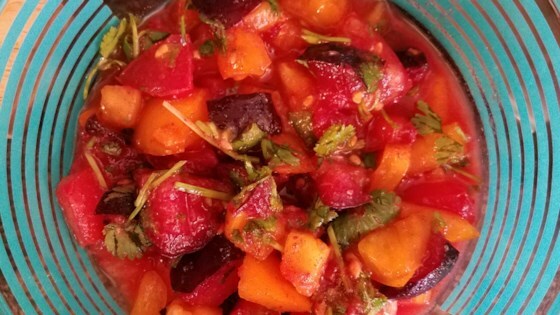 "The plums absorb the full-bodied spiciness of the salsa to give it a light, smoky-sweet flavor. Perfect as a side or snack on a hot summer day or as an accompaniment to tacos or grilled pork. This salsa can be heated up to taste by adding more or hotter varieties of peppers. As is, this salsa would probably be classified as mild." Mix tomatoes, onion, plums, poblano chile pepper, cilantro, garlic, lime juice, salt, black pepper, and chili powder in a bowl; cover with plastic wrap. Refrigerate until flavors blend, at least 1 hour. For hotter salsa, add 1/4 teaspoon powdered cayenne pepper and an additional fresh chopped habanero or serrano pepper. This is awesome! And very easy to substitute ingredients if you are missing any. I'm crazy about this recipe and so are my friends. I'm surprised this recipe isn't rated higher. It is quite easy to adjust to your tastes and it seems quite forgiving. I've made this 3 times and it always pleases. I add more plums and cilantro but the rest stays the same. Yum.